Bending forming is widely applied in the forming of sheet metal parts, which featured high forming efficiency, good quality, time-saving, and reducing the processing cost of the parts. However, due to the inadequate grasp of the bending process, the process personnel often adopt the conservative process method to realize the final forming of the parts, for example, hand forming and hydraulic forming. Such techniques will increase the cost of parts processing due to the use of forming tooling. The increase of human activities will result in unstable parts. It also reduces the machining efficiency of the parts. Therefore, it is an important task to fully grasp the bending forming technique. Many aspects need to be considered when choosing a bending forming technique. Once negligence will lead to the failure of the process to be implemented, the development of the parts will be affected. 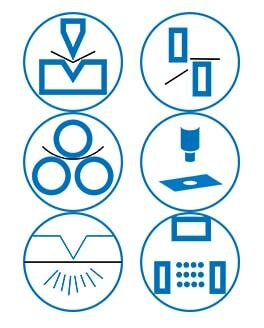 In this post, we mainly discuss the size calculation of expanded materials, bending tool selection, typical parts process analysis, problems and solutions that occur frequently during the bending process, which will form a guiding paper to the technologist who will take it as an important guide in the preparation process of sheet metal parts. It will make a contribution to reducing the processing cost of parts, improving the quality and production efficiency of parts. This paper mainly focuses on discussing size calculation, bending tool selection, process analysis of typical parts, common problems and solutions in the bending process. The expansion size of the sheet is related to the thickness, material, bending angle, bending toolings, etc. The two commonly used methods for calculating the length of metal sheet expansion are the neutral layer calculation method and the empirical calculation method. 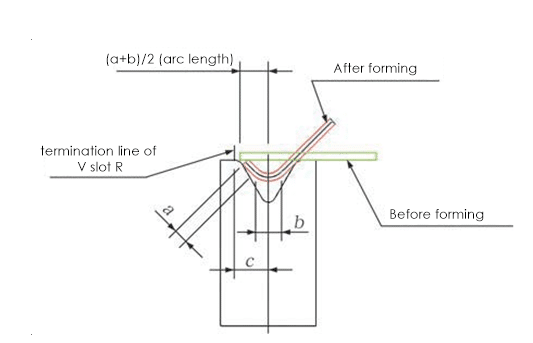 This method is suitable for the condition that the bending angle is the non-right angle. During the bending process, the outer layer is subjected to tensile stress and the inner layer is subjected to compressive stress. The transition layer between the inner and outer layers is under neither tensile stress or compressive stress is called neutral layer. The neutral layer does not change as long as it does before bending, so the neutral layer is the base layer for calculating the length of the bending part. But the position of the neutral layer is related to the thickness of the material. In general, the distance between the neutral layer and the inner surface of the bending part is 0.5t when the thickness of the plate is less than 4mm. When the plate thickness is greater than 5mm, the distance is 0.34t. The expansion length of the neutral layer is the expansion length of the plate. This method is applicable to the condition that the bending angle of the part is the right angle and the thickness of the plate t ≤ 3mm. 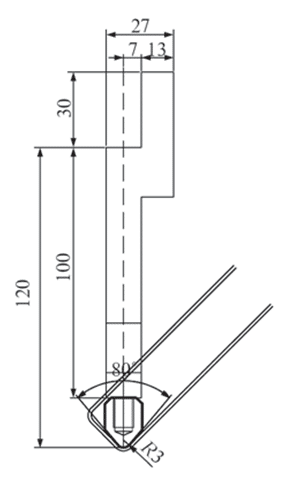 This method can assist the operator to calculate the expansion length of the parts. How to choose the right tool in the bending process is a key problem. The bending tool is divided into the top tool and bottom tool, namely punch and die. The press brake punch and die are chosen according to the thickness and the bending size of the parts in order to avoid deformation caused by the collision between bending parts and punch die. 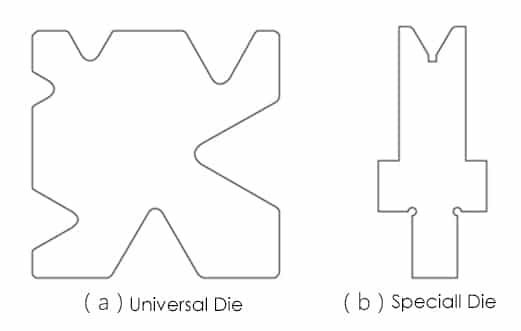 The press brake is equipped with universal lower die and special die (figure 2). All notches for “V” shape, the angle of the slot is 60 °. Generally, the thicker the plate is, the wider the slot is, and the width of the slot is generally 8t. Check out this article to learn the relationship between plate thickness and slot width as well as how to calculate the required bending force. 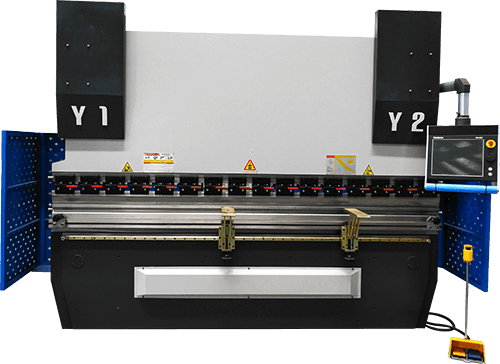 The press brake punch mainly includes straight punch, gooseneck punch, small bending punch, hemming punch etc., and can also customize the special tool according to the actual situation of the parts. The straight punch is mainly used for bending the parts with the thickness t ≤ 3mm. The small gooseneck punch is mainly used for bending the “U” shape parts with shallow depth. 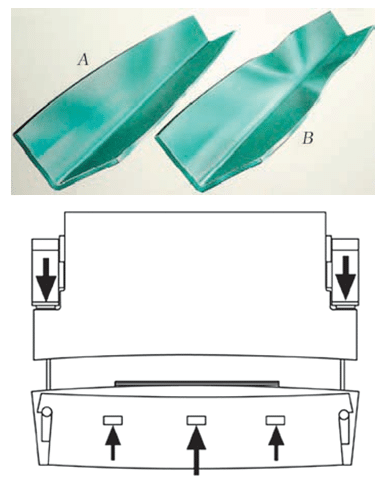 The gooseneck punch mainly used to bend “U” shape parts with deep depth. The hemming punch is mainly used to flatten the parts. Usually, we choose the bending tool according to the bending radius of the part to ensure the bending radius of the parts. But sometimes we ignore the lower die. 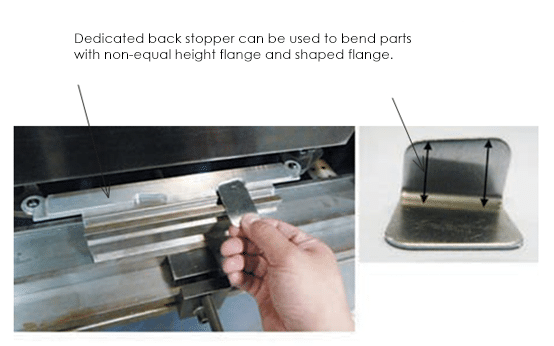 In some cases, the bending punch and the bending die are not reasonable, resulting in the indentation on the two sides of the bending radius after the bending forming and this is unable to repair. Figure 3 shows the material thickness of 1.6mm of the simulated part, the bending radius R4 and the bending height of 8.9mm. After analysis, the lower die slot can be selected with V12 and a smaller one. But for this part, it can only choose the V12 slot. The specific reasons can be seen in the figure. On the left is the V10 slot, and the right side is the V12 slot. Since the resilience of the parts bending need to be considered, thus the bending angle input in the press brake controller should less than 90°. However, for the 90° bending flange in above simulation figure, you can see that if the punch of the press brake continues to go down, the extrusion of the V10 slot is serious while V12 slot almost has no extrusion. Therefore, the lower die with V12 slot should be selected instead of V10 and a smaller one. In this way, the two sides of the bending radius after bend forming is free of indentation, no need to do finishing and the parts are qualified. The height of the flange and the width of the web should be taken into consideration when the parts are bent. Sometimes if the width of the web is too small, and the flange height is too high, it will lead to the interference of the earlier formed flange and the bending tool during bend forming process, which cause the subsequent bending cannot be continued. If there is no remedial action, it is likely that the whole batch of materials will be scrapped, which will increase the processing cost. In the following, we will analyze the bending of “U” shape parts and “Z” shape parts. The key to the bending of the “U” shape is the relationship between the height (H) of the two flanges of the part and the width (B) of the web. When H ≤ B, generally it is possible to bend into shape, but there is also the possibility of interference. This kind of interference is the interference of part bending flange and machine body. For the general press brake machine, when the bending height H ≥ 80mm, the part will interfere with the bending machine during parts bending. 1) Before bending the part, bend an obtuse angle on the part of the web, opposite the flange direction of the part. This allows the parts not interfered with the bending machine when bending. When the flange bending into right angles on both sides, then use hemming tool to flatten the obtuse angle of the web of the part. But this method will leave some indentation at the bending position. 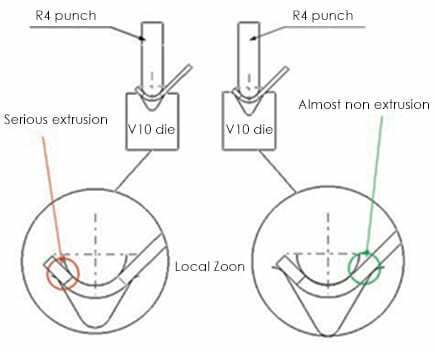 2) When the bending width of the part is less than 200mm, it is possible to select a special upper die – suspended punch (figure 4) which is used for flange bending of parts. The flange of the parts is completely shielded from die interference. Due to the limitation of the upper die structure and strength, this method is suitable for parts which width is less than 200mm. The “Z” curved edge part in sheet metal parts is characterized by small size and large quantity. If the technicians adopt conservative hand forming process to achieve the shape of the parts, the efficiency is low and the quality is unstable. Due to the size limit of the part webs and the size of the bending die, the parts should be simulated and analyzed before the bending process is selected. According to the parameters that need to be used in the simulation analysis, the classification is shown in table 1. Through the above table, the technicians can accurately determine whether the parts can be formed by bending technique. When L +P >T /2, the parts bend forming can be realized. Because of the limitation of the punch and die equipped on the press brake, not flange with various height can be formed with the press brake. Therefore, when select parts bending method, carefully analyzation and simulation should be carried out to check whether the parts can be bent. In technical analysis and preparation, CATIA can be used to simulate whether the bending height of the part can be realized. 4）Base on the neutral layer to calculate the position of positioning end on the lower dies during bending. 5）The small R at both ends of V groove should be considered when simulating. According to the above requirements, the simulation is shown in figure 5.
black line – the neutral layer of the part. a – the linear dimension of the neutral layer. 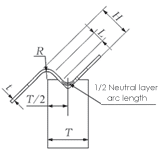 b – the arc length of the neutral layer at the bending radius. 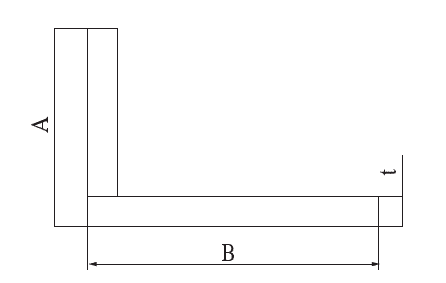 c – the distance between the tool center and the termination line of V slot R.
If (a+b)/2＞c, it can bend. if (a+b)/2≤ c，it cannot bend. Through the above judgment, if the size of the part is too small for bending, the overall flange size of the parts need to be increased when preparing the technique. Press brake machine is affected by the structure of the machine tool itself when bending large length parts so that the bending beads of the bending parts are greatly deformed. In theory, it is a straight line, but after bending, it is actually a curve line, which requires workers to complete the bending of the parts by a lot of finishing. For such problem, we can adjust the crowning which is equipped on the press brake according to actual condition after bending to eliminate the deformation of the parts (figure 6), so as to reduce the labor works and improve the quality of the parts and production efficiency. In sheet metal parts, some parts are partially reduced to reduce weight. In the actual production, the parts can be formed by hydraulic forming or bending. However, due to the inconsistent thickness of the material for bending, the one-time bend forming can’t be carried out with same punch and die. For this kind of situation, we can add paddings with thinned size to the thinning area of the material, place the paddings after bedding in the area corresponding to the top punch. When the bending is formed, the cushion will make R compensation to the punch, and the bending of material with different thickness can be formed at one time. Most of the standard rear positioning stopper equipped with press brake are straight line type. Multiple back stoppers are in a straight line. As a result, it can only bend parts with an equal-height flange. 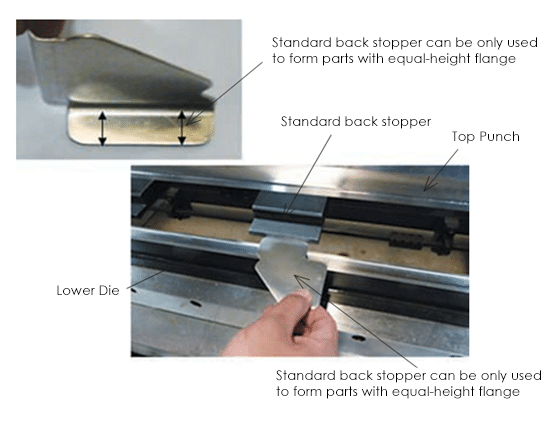 For those parts with non-equal height flange and shaped parts, the conventional back stopper of press brake is incapable. 1) According to the shape features of parts with non-equal height flange and special-shaped bending parts, to design the back stopper with the dedicated purpose. The dedicated back stopper adopts bolt for positioning which changes the conventional positioning method of press brake machine and solved the problem of the bending for parts with non-equal height flange and shaped flange. 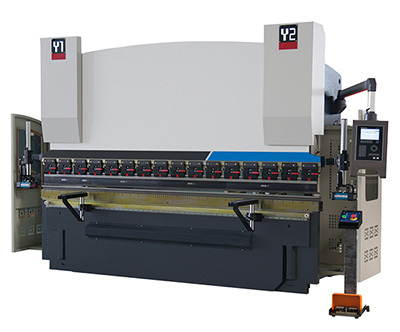 This also expands the use range of press brake. The pre-processing and post-processing states are shown in figure 7 and figure 8 respectively. 2) When blanking, add assistant position earpiece to the bending parts. The earpiece is at the highest level with the parts, namely the parts and ear plates positioning can be used for bending and forming. Remove the earpiece after bending to realize parts bend forming. The production efficiency is improved a lot. The fiber direction of the expanded material. When the rupture occurs, we can change the direction of the fibers of the unfolding material, and make it perpendicular to the bending line; Or adopt annealing process on the bending parts to make it soft. The application scope of bending forming process in sheet metal parts production is expanded by the discussion and analysis of the various situations encountered in the technique of bending. At the same time, it also fundamentally avoids the influence on the whole development cycle of the parts due to the process selection error, thus improving the overall efficiency of the parts production and stabilizing the quality of the parts. From the development of the bending technique, to design more reasonable bending tooling will make a greater contribution to expanding the application of the bending forming technique.